As part of the widest range of commercial electric vehicles offered by any North American OEM, the all-new, all-electric Freightliner eCascadia and eM2 106 trucks are designed for specific applications and created with input from customers who rely on both diesel models. The class-8 Freightliner eCascadia is a heavy-duty, on-highway truck with an up to 250-mile range, designed for local and regional distribution and drayage. The eM2 106 is a medium-duty workhorse, with an up to 230-mile range, built for local distribution, pickup and delivery, or food and beverage delivery. 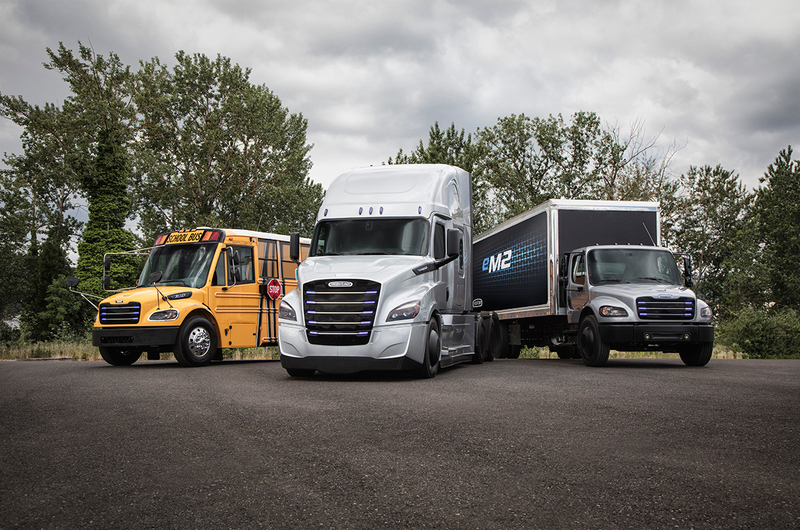 At Daimler Trucks North America, we continue to pursue proprietary, integrated electrification solutions with an increasingly diverse lineup of commercial electric vehicles. Our next step is to learn more from our Freightliner Electric Innovation Fleet. These trucks are designed to meet customer needs for electrified commercial vehicles serving dedicated, predictable routes where the vast majority of daily runs fall between 45 and 150 miles. These 30 vehicles will begin real-world testing in customer hands later this year. We are also committed to helping our customers overcome emerging EV challenges through the development of a charging-system standard for battery-powered commercial vehicles. DTNA is leading the CharIN taskforce with the objective of defining a new commercial vehicle, high-speed charging standard (>1MW) to maximize customer flexibility. In collaboration and consultation with utilities, service providers, charging system manufacturers and our fleet, we help create a win-win solution for new commercial EV infrastructure. In addition to the exciting new Freightliner eCascadia and eM2 trucks, Daimler is leading the pack from North America with the Thomas Built Buses electric school bus. The C2 Saf-T-Liner or “Jouley” school bus from Thomas Built Buses was introduced last year in anticipation of limited production beginning in 2019. With decades of experience in successfully producing durable commercial vehicles in high volumes, our history of innovation empowers us with the knowledge and experience we need to continue to lead the industry, while reminding us to always prioritize the vital input of our customers who drive our trucks every day. We will continue to act on their ideas and pain points to both validate and improve our products as we move into an electrifying future.